Serato just released Serato DJ 1.9.6, an update that focusses on improvements in Serato DVS. Turntable users rejoice: Serato just released Serato DJ 1.9.6, an update that includes DVS-specific tweaks like Smart Sync, improved Sticker Lock, and the new Anti-Drift feature. The latter calculates a track's overall average tempo and displays it, so instead of the usual jittery BPM (DVS users will know what I'm talking about), what you get is a stable tempo display that's perfect for beatmatching and executing longer mixes. Also included in the update are improvements to Needle Drop and the Sticker Lock feature, Pitch Play mappings for more hardware, and support for the Reloop RMX-90 four-channel mixer. Call me shallow, but the fickle BPM readings inherent in DVS is a bit of a turn off for me. I beatmatch by ear, but there's just something distracting about a volatile tempo display, especially when you're trying to lock in more than two decks. Anti-Drift looks promising, though, and is a good addition to the list of gains in Serato DVS. • Serato DJ 1.9.6 is available now. Check the Serato DJ website for more details. 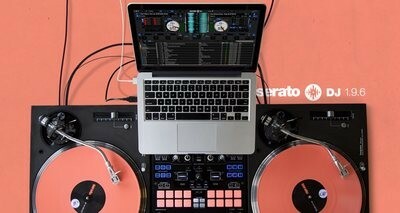 Are you a Serato DVS user? Think the Anti-Drift feature is useful? What other features would you like Serato DVS to have in upcoming versions? Share your thoughts below.